Spectrum of a blue/green electroluminescent light source for a clock radio (similar to the one seen in the above image). Peak wavelength is at 492 nm and the FWHM spectral bandwidth is quite wide at about 85 nm. Light-emitting capacitor, or LEC, is a term used since at least 1961  to describe electroluminescent panels. General Electric has patents dating to 1938 on flat electroluminescent panels that are still made as night lights and backlights for instrument panel displays. The drawbacks of conventional electroluminescent lights are low efficiency and lifetimes limited to hundreds of hours. Electroluminescent panels are a capacitor where the dielectric between the outside plates is a phosphor that gives off photons when the capacitor is charged. By making one of the contacts transparent, the large area exposed emits light. 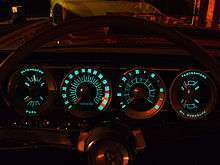 Electroluminescent automotive instrument panel backlighting, with each gauge pointer also an individual light source, entered production on 1960 Chrysler and Imperial passenger cars, and was continued successfully on several Chrysler vehicles through 1967. Sylvania Lighting Division in Salem and Danvers, MA, produced and marketed an EL night lamp (right), under the trade name Panelescent at roughly the same time that the Chrysler instrument panels entered production. These lamps have proven incredibly reliable, with some samples known to be still functional after nearly 50 years of continuous operation. Later in the 1960s, Sylvania's Electronic Systems Division in Needham, MA developed and manufactured several instruments for the Apollo Lunar Lander and Command Module using electroluminescent display panels manufactured by the Electronic Tube Division of Sylvania at Emporium, PA. Raytheon, Sudbury, MA, manufactured the Apollo guidance computer, which used a Sylvania electroluminescent display panel as part of its display-keyboard interface (DSKY). Powder phosphor-based electroluminescent panels are frequently used as backlights to liquid crystal displays. They readily provide a gentle, even illumination to the entire display while consuming relatively little electric power. This makes them convenient for battery-operated devices such as pagers, wristwatches, and computer-controlled thermostats, and their gentle green-cyan glow is a common sight in the technological world. They do, however, require relatively high voltage (between 60 and 600 volts). For battery-operated devices, this voltage must be generated by a converter circuit within the device; this converter often makes an audible whine or siren sound while the backlight is activated. For line-voltage-operated devices, it may be supplied directly from the power line. Electroluminescent nightlights operate in this fashion. Brightness per unit area increases with increased voltage and frequency. Thin film phosphor electroluminescence was first commercialized during the 1980s by Sharp Corporation in Japan, Finlux (Oy Lohja Ab) in Finland, and Planar Systems in the USA. Here, bright, long-life light emission is achieved in thin film yellow-emitting manganese-doped zinc sulfide material. Displays using this technology were manufactured for medical and vehicle applications where ruggedness and wide viewing angles were crucial, and liquid crystal displays were not well developed. In 1992, Timex introduced its Indiglo EL display on some watches. Recently, blue-, red-, and green-emitting thin film electroluminescent materials that offer the potential for long life and full color electroluminescent displays have been developed. In either case, the EL material must be enclosed between two electrodes and at least one electrode must be transparent to allow the escape of the produced light. Glass coated with indium tin oxide is commonly used as the front (transparent) electrode while the back electrode is coated with reflective metal. Additionally, other transparent conducting materials, such as carbon nanotube coatings or PEDOT can be used as the front electrode. The display applications are primarily passive (i.e., voltages are driven from edge of the display cf. driven from a transistor on the display). Similar to LCD trends, there have also been Active Matrix EL (AMEL) displays demonstrated, where circuitry is added to prolong voltages at each pixel. The solid-state nature of TFEL allows for a very rugged and high-resolution display fabricated even on silicon substrates. AMEL displays of 1280x1024 at over 1000 lines per inch (lpi) have been demonstrated by a consortium including Planar Systems. 1966 Dodge Charger instrument panel with electroluminescent lighting. Chrysler first introduced cars with EL panel lighting in its 1960 model year. In principle, EL lamps can be made in any color. However, the commonly used greenish color closely matches the peak sensitivity of human vision, producing the greatest apparent light output for the least electrical power input. Unlike neon and fluorescent lamps, EL lamps are not negative resistance devices so no extra circuitry is needed to regulate the amount of current flowing through them. A new technology now being used is based on multispectral phosphors that emit light from 600 to 400nm depending on the drive frequency; this is similar to the colour changing effect seen with aqua EL sheet but on a larger scale. Electroluminescent lighting is now used as an application for public safety identification involving alphanumeric characters on the roof of vehicles for clear visibility from an aerial perspective. Electroluminescent lighting, especially electroluminescent wire (EL wire), has also made its way into clothing as many designers have brought this technology to the entertainment and night life industry. Engineers have developed an electroluminescent "skin" that can stretch more than six times its original size while still emitting light. This hyper-elastic light-emitting capacitor (HLEC) can endure more than twice the strain of previously tested stretchable displays. It consists of layers of transparent hydrogel electrodes sandwiching an insulating elastomer sheet. The elastomer changes luminance and capacitance when stretched, rolled and otherwise deformed. In addition to its ability to emit light under a strain of greater than 480 percent its original size, the group's HLEC was shown to be capable of being integrated into a soft robotic system. Three six-layer HLEC panels were bound together to form a crawling soft robot, with the top four layers making up the light-up skin and the bottom two the pneumatic actuators. The discovery could lead to significant advances in health care, transportation, electronic communication and other areas. ↑ Raguse, John (April 15, 2015). "Correlation of Electroluminescence with Open-CIrcuit Voltage from Thin-Film CdTe Solar Cells". Journal of Photovoltaics: 4. doi:10.1109/JPHOTOV.2015.2417761. ↑ Ron Khormaei, et al., "High Resolution Active Matrix Electroluminescent Display", Society for Information Display Digest, p. 137, 1994. ↑ "Active Matrix Electroluminescence (AMEL)" (PDF). ↑ "air-el". Federal Signal. Retrieved July 23, 2016. ↑ Diana Eng. "Fashion Geek: Clothes Accessories Tech". 2009. ↑ Cornell University (March 3, 2016). "Super elastic electroluminescent 'skin' will soon create mood robots". Science Daily. Retrieved March 4, 2016. Wikimedia Commons has media related to Electroluminescence. Chrysler Corporation press release introducing Panelescent (EL) Lighting on 8 September, 1959.